about a third of our native bird species are at risk of disappearing forever (becoming extinct). can vote for their favourite native bird. This year, the winner was the kererū (or woodpigeon). description. Be sure to attribute your picture properly. the bird I´ve chosen for today's task ( Grey Warbler ). wanted. How amazing would that be?! the looks on peoples faces as there watching me take any type of food or drink I've taken. ( tag, Hide and Seek, Etc. ) as I am invisibly and I can just turn invisible anytime I want. free to check the other two activities. the World’ website to learn more about these incredible animals. instructions for attributing your pictures properly. Here is an example of a DLO that was created about lions. On your blog, post a final copy of your DLO.. Image Attributions will be below the DLO copy. One of the most important, but least talked about, animals in New Zealand is the bumblebee. the most sense from the list at the bottom. (Each phrase/word can only be used once). blanks for each one. Post the completed sentences on your blog. to _______hum, buzz or drone.______. in food with them to avoid starvation. honeybees. In fact, they can do up to _50__ times as much work as a normal honeybee. in the sink. Yuck! What about you? On your blog, list all of the foods that you would put in your special draining sink..
Peas, Asparagus, Tripe, Fruit - Cake, Apricots, Tomatoes, spinach, and Anchovy´s. post your final answer in days or weeks. Let’s imagine that we tested the air in your classroom and found 7 different kinds of mould. get removed is 35 days. Overall Answer In Days: 35 DAYS! Overall Answer In Weeks: 5 Weeks! For this task I was to fill in the missing blanks written in the first activity, for the second activity I was to write a list tell you all what my least favourite foods are, and for the final activity I was to figure out a maths problem, the maths problem included moulds. For more information written about this feel free to check out my post, Enjoy and Happy New Year! If you would like some help making a decision, feel free to read the Go New Zealand website. It has lots of information about the seasons in NZ! spots are less busy than they are in the middle of summer. On your blog, tell us what time of year you think is best for tourists for come and visit. always ends up with loads of crowds ( especially at sport games ), Last but not least Winter. which will be fantastic for you and your family. Here's a little document I´ve created for you, Enjoy! 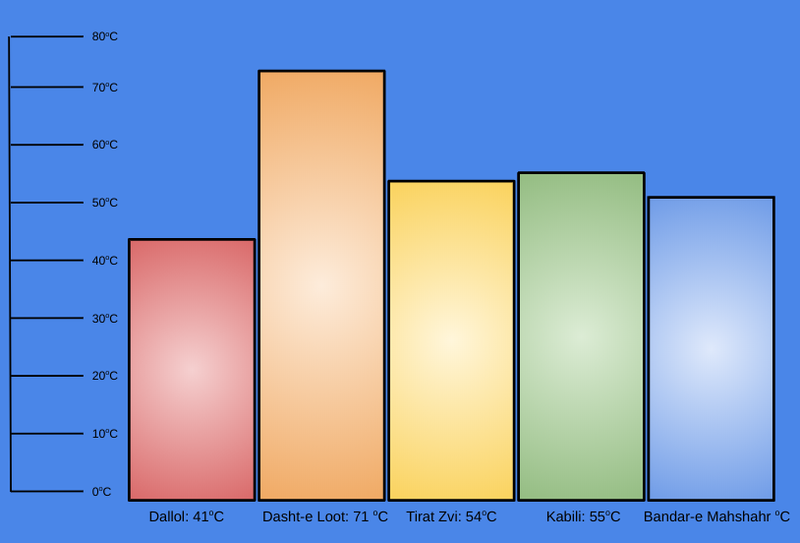 Zvi: 54oC; Kabili: 55oC; Bandar-e Mahshahr: 51oC. Crazy ‘eh?! have a title along with the names of each city and their hottest recorded temperatures. create your graph. It’s completely up to you! For this task of Week 3, Day 1 I was to write a text about what´s the best season to visit New Zealand and my answer to that was Spring, the next activity was based on protecting ourselves from the sun the main one that should be on your list is Sunscreen, And for the final activity I was to create my own graph about the hot temperatures I was given to me. Overall I really enjoyed todays task and hope to post more similar to todays task. Enjoy week 3´s post. Enjoy it and Happy New Year!